The kind folks at Tea Mania noticed my love for oolong teas, and I thank them for the opportunity to try an very nice oolong tea. Overall, I found this oolong tea to be quite excellent – aromatic, full-flavored, and very satisfying. After my first sip, this tea went fast! Oolong # 17 Jade Pearls First Flush is picked by hand and rolled. It’s well known for its distinctive flavor and fragrance notes: a little bit orchid and a hint of lily of the valley. 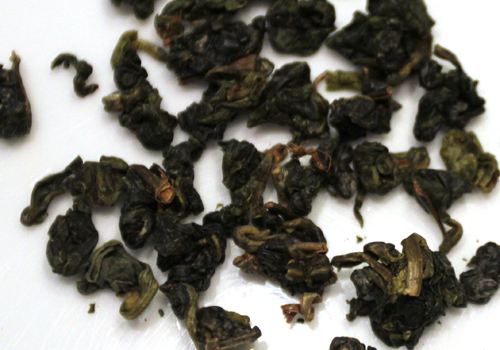 Oolong # 17 Jade Pearls First Flush is only picked in the winter. The slow growth in the winter helps to develop the complex flavors. The Jade Pearls First Flush is striking and beautiful, with large hand-rolled bundles of tea and leaf tip. The tea is a deep spring-time green, and intensely aromatic. Rinsed with hot water and then steeped for two minutes, the tea is unusually fragrant and aromatic as it steeps. The leaves uncoil and expand into large full leaves, and a deep vibrant green color. The color of the steeped tea is a bright, clear yellow with medium body. The flavor from the first steep is muted yet distinct – herbal, floral, and a very smooth yet subtle flavor. The taste and experience is much more in the smell of the tea rather than the taste for this initial experience. The second steep is more flavorful, a pleasant astringent base with a mellow floral taste. An excellent tea overall with a smoother and lighter taste compared to other oolongs. The tea can be purchased at the Tea Mania website site here.